An issue has been swirling around Cambodia’s microfinance circles for some months. Put simply, will poor Cambodians be able to use “movable assets” – motorbikes, cars, livestock or agricultural machinery, for example – as collateral on loans? In some respects, the debate makes no difference; a far as I know, there is currently no law that prevents a microfinance institution (MFI) from accepting, say, a Honda Dream worth $800 as collateral for a loan of equal value. “I’m not aware of any specific regulation that explicitly prohibits [or] allows MFIs from using movable assets as collateral,” Miguel Chanco, lead analyst in the ASEAN region for the Economist Intelligence Unit, told me. Indeed, many other countries’ MFIs readily accept them (though following the herd is rarely a good decider of policy). But at the moment there is a healthy amount of skepticism in Cambodia, especially by the country’s leading, and most trusted, MFIs. A November article by Hor Kimsay, a business reporter for the Phnom Penh Post, quoted Say Sony, senior vice president of Prasac Microfinance, one of Cambodia’s largest MFIs, as saying that the problem with movable assets is that they “can be quickly sold to dealers or pawn shops.” If this happens, the MFI is left saddling a defaulted debt and no collateral to collect. Bun Mony, an adviser to the Cambodian Microfinance Association and CEO of Sathapana Bank, another MFI, however was quoted in the same article saying that “financial institutions have been trying to incorporate movable assets into their collateral portfolio because it would provide more opportunities for borrowers to take out loans,” as Kimsay phrased it. But he too admitted problems with doing just that. Here, then, we find the pulse of the microfinance community in Cambodia: they want to start allowing movable assets as collateral but are rightly cautious of doing so. Indeed, most Cambodian MFIs temper their optimism by saying that a legal framework needs to be created to restrict what borrowers can do with their movable assets, and a registry to monitor their past activities. Again, this would be in line with most other countries. But how possible this is, however, is not known. No doubt. But other experts say continued growth is to be avoided. Indeed, how much growth should be desired: Until half of the population is borrowing? Or all Cambodians? The present-day figures are worrying. Cambodians collectively owed $3.1 billion to MFIs at the end of last year, according to a World Bank report, and 88 percent of borrowers live in impoverished rural areas. 28 percent of microfinance borrowers have multiple outstanding loan accounts, found a 2016 report by the Credit Bureau Cambodia, the country’s only credit agency. Moreover, Kimsay wrote, “over 85 percent of these outstanding loans were designated as for personal finance – often to purchase the very same movable assets that consumers would hope to put down as collateral when applying for additional credit.” Applying for credit with the same goods bought on credit is rarely a good idea. 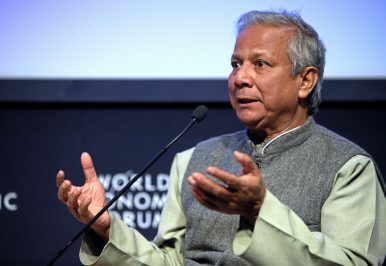 In some ways it comes back to the epithet made famous by Muhammad Yunus, the Nobel Peace Prize-winning founder of Grameen bank, the Bangladeshi MFI that kick started the global “movement.” A few years ago he said that “credit is a fundamental human right.” Credit, however, is not a human right. Other writers have pointed out how it is one example of the proliferation of new “rights” that effectively devalues other human rights. But another consideration deserves some attention: What is the relationship between microfinance and politics? This issue arose in March when the Cambodian government, through the National Bank of Cambodia, imposed an interest rate cap on microfinance loans. The move was panned by most analysts who thought it was unhelpful intervention and regulation. My view is that it should have come much sooner. Microfinance, as once a noble idea, has become a grand scheme to try to make as much money as possible, from the greatest number of people as possible. Given that the poor lack options and tend to naturally be in desperation (at least so it seems to them most of the time), microfinance has been a catch phrase for lenders to make big returns with little accountability to whether those loans should have been lent in the first place. Without regulations and enforcement, in a very sad sense, microfinance is a formalized scheme for loan sharks. I think that rich countries have fallen into this trap with welfare systems where able-bodied humans are paid to sit around and do nothing. This is a system that produces zombies. By giving money to beggars you have the same response. It is the system, not your conscience, that needs reforming. To some extent, I understand where Yunus is coming from. Most poor countries are unlikely, or incapable, of introducing welfare systems like those found in rich nations. So, an alternative is needed. But shouldn’t welfare systems at least be the main aspiration and alternatives the fallback? Yunus, clearly, thinks not and, perhaps, for ideological reasons, not just practical ones. “Yunus implicitly argues that non-state actors should be obligated to make the right to credit meaningful because of the state’s incapacity to fulfill the right,” one academic wrote. Here, one finds a sophistry in the microfinance worldview: It is the responsibility of the state to ensure the poor can access credit, ostensibly for people remove themselves from poverty, but the same state is incapable of (or shouldn’t be, for some) doing this itself. Microfinance should be the last resort for the poor, not the first solution. One should be hoping for a time when fewer, not more, Cambodians need short-term loans. And, in the ideal world, MFIs should be working towards their own demise, not to even larger portfolios.